#9 Providence secured the 2018 Nutmeg Classic title with a 2-1 win over Quinnipiac on Saturday. After topping host Yale, 2-1, on Friday, sophomore Haley Lunny (Bedford, N.Y.) posted two third-period goals in the championship game against the Bobcats to lift the Friars to victory. Senior goaltender Madison Myers (Colchester, Vt.) was tournament MVP after allowing just one goal in each game. #4 Boston College won two league contests last week, topping fierce rival Boston University, 4-3, on Tuesday before taking a 5-0 decision at Holy Cross on Saturday. Eagles rookie Kelly Browne (Burlington, Mass.) tied for the lead in all of Hockey East with three goals last week, including two against Holy Cross on Saturday. Megan Keller (Farmington Hills, Mich.) and Makenna Newkirk (Scottsdale, Ariz.) each recorded their 100th career assists last week in an Eagles uniform. 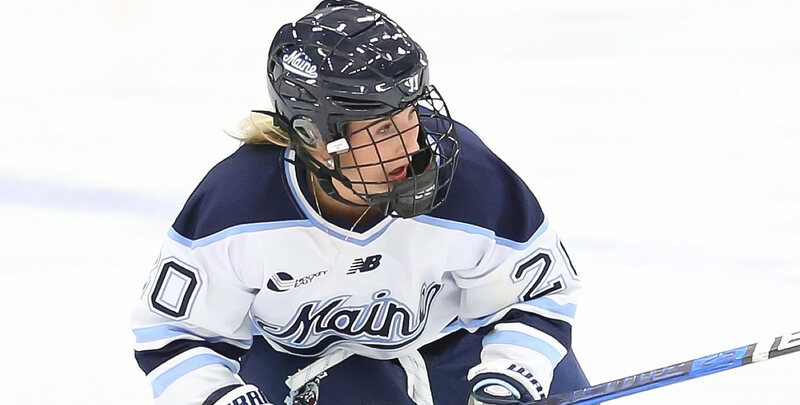 Maine swept Dartmouth in a two-game home stand, paced by five points from rookie forward Celine Tedenby (Ornskoldsvik, Sweden). She had two goals and assisted on the game-winning strike in Friday's 4-1 win before notching another tally and helper in Saturday's victory by the same score. Carly Jackson (Amherst, N.S.) started both games, allowing just two goals and stopping 32 of 34 shots she faced. New Hampshire took a 1-0-1 mark against RPI to extend its unbeaten streak to three games. Meghara McManus (Milton, Mass.) potted two goals on Saturday in a 4-1 win, her third multi-goal game. Kyra Smith (Littleton, Colo.) stopped 41 shots and allowed just two goals to pick up a .953 save percentage and a 0.96 goals against average. Hayley Lunny (So., F; Bedford, N.Y.) Buried two goals in the third period to lead Providence to the 2018 Nutmeg Classic championship. The Friars were trailing, 1-0, when Lunny scored the tying goal at the 8:03 mark of the third on the power play before giving Providence the 2-1 lead with just 5:24 left in the game. The two scores were her first since the season's opening game on Oct. 5. 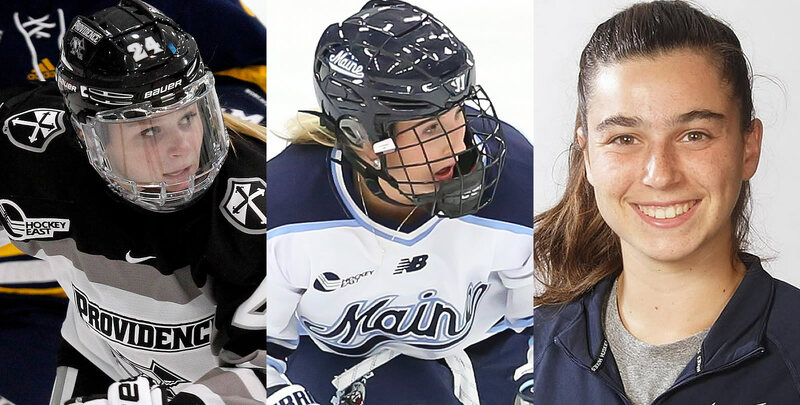 Celine Tedenby (Fr., F; Ornskoldsvik, Sweden) Racked up a five-point weekend on three goals and two assists to help power the Black Bears offense to a sweep of Dartmouth on home ice. She had two goals and assisted on the game-winning strike in Friday's 4-1 win before notching another tally and helper in Saturday's victory by the same score. Samantha Carpentier-Yelle (Fr., G; Bromont, Que.) won her second career game and first shutout on Saturday in a 1-0 win at Yale in the thirdplace game of the Nutmeg Classic. She stopped 28 shots in the outing, including 17 in the third period to preserve the one-goal victory for the Huskies. Kelly Browne, BC (Fr., F; Burlington, Mass.) Lead Hockey East with three goals last week, including two against Holy Cross on Saturday. Paced all rookies with 21 faceoff wins and put six shots on net. Megan Keller, BC (Sr., D; Farmington Hills, Mich.) Dished out three helpers to power BC to a two-win week, including two assists on Tuesday against rival Boston University. On Saturday, she notched her 100th career assist and pushed her career-high point streak to 10 games (5g, 10a). Jesse Compher, BU (So., F; Northbrook, Ill.) Scored a goal and added an assist at #4 Boston College on Tuesday while going 10 for 15 at the faceoff dot. Mackenna Parker, BU (Fr., F; Clavet, Sask.) Netted her third goal in as many games on Tuesday, striking in the first period to knot the game at two apiece. Morgan Wabick, UConn (So., F; Winnipeg, Man.) Assisted on both UConn goals in a 3-2 setback to Quinnipiac in the opening round of the Nutmeg classic. She currently is third on the team with 12 points on six goals and six assists. Danika Pasqua, UConn (Fr., F; Langley, B.C.) Found the back of the net twice in the second period against Quinnipiac on Friday, knotting the game at 2-2. Viki Harkness, UConn (Fr., F; Berwick, Ont.) Scored the game-winning goal on Saturday in a 1-0 victory over Yale to secure third place in the 2018 Nutmeg Classic. Carly Jackson, ME (Jr., G; Amherst, N.S.) Started both games of a weekend sweep of Dartmouth, allowing just two goals and stopping 32 of 34 shots she faced. Lea-Kristine Demers, MC (Jr., G; Repentigny, Que.) Earned the first shutout of her career, stopping all 30 shots she faced on Tuesday at Quinnipiac to give Merrimack a 2-0 victory over the Bobcats. Gabby Jones, MC (Fr., F; Westfield, Mass.) Scored the game-winning goal in Tuesday's 2-0 victory at Quinnipiac. Meghara McManus, UNH (Jr., F; Milton, Mass.) Potted two goals on Saturday in a 4-1 win over RPI, her third multi-goal game. She finished a 1-0-1 weekend for New Hampshire with a plus-two rating. Lauren Martin, UNH (Fr., F; Cambridge, Ont.) Tallied her first career NCAA goal in a 4-1 win over RPI on Sunday and picked up an assist for the second multi-point outing of her career. 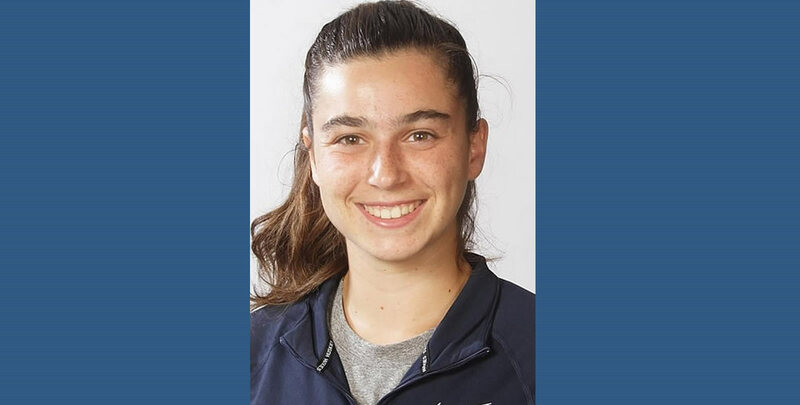 Kyra Smith, UNH (Sr., G: Littleton, Colo.) Went 1-0-1 in two games against RPI, stopping 41 shots and allowing just two goals to pick up a .953 save percentage and a 0.96 goals against average. Sara Hjalmarsson, PC (Fr., F; Bakeryd, Sweden) Scored the game-winning goal in Friday's 2-1 victory at Yale to advance to the Nutmeg Classic championship game. Madison Myers, PC (Sr., G; Colchester, Vt.) Was named the Nutmeg Classic MVP after allowing just one goal in each game of the annual tournament and stopping 34 total shots across her two outings. She backboned the Friars to the pair of victories, improving her personal record to 11-1-0 on the year. She has allowed one goal or fewer in eight of her 12 starts this season. Eve-Audrey Picard, UVM (Jr., F; Longueuil, Que.) Earned up three assists in the Windjammer Classic, including a helper on Friday's game-winning goal against Syracuse, a 2-0 victory for the Catamounts. Theresa Schafzahl, UVM (Fr., F; Weiz, Austria) Scored the game-winner on Friday against Syracuse and picked up an assist in a 6-2 setback to #2 Minnesota in the championship game. Melissa Black, UVM (Sr., G; Newmarket, Ont.) Picked up a 30-save shutout on Friday, a 2-0 win against Syracuse.